Removal, Installation, Whatever You Need! 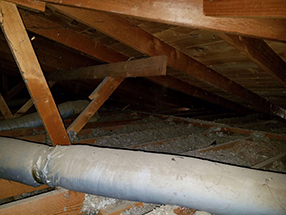 Has your insulation suffered damage from water or pests that have invaded your attic? If so, it's best to have it replaced. It's what helps keep the temperature in your home stable, otherwise your heater and air conditioning will have to run far more to keep up. This leads to a nasty energy bill down the line, so instead allow us to handle it! We'll safely remove what's there and install new material in no time. Do you have a new home being built and need insulation installed, or simply want to add to what your home already has? We can do that as well! We'll help you determine what type and amount suits your attic best, so you can be satisfied with the results. Does Your Attic Need Cleaning? 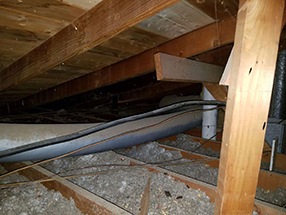 You may think that inch of dust over everything in your attic isn't a big deal if nobody goes up there often, but this isn't true! That build-up can easily cause mold to grow and spread, which can enter the air of your home and lead to health hazards. That's where a professional attic cleaning comes in handy! Rodents that have already gone still will have left behind waste, and the disease carried in it can also enter your home and pose a health risk to your family. It's best to get it decontaminated along with the cleaning, that way every trace of bacteria will be removed by our experts. It will make your attic and home safer all around! We also offer rodent proofing, so you won't have to worry about it happening again. Keeping your company's building in good shape is one of the best ways to bolster your employees' work output. If there are cold spots in the building from poor insulation, it will be hard for them to keep up a good pace! We can handle it for you. Contact Air Duct Cleaning Tiburon today, and let us get to work for you.